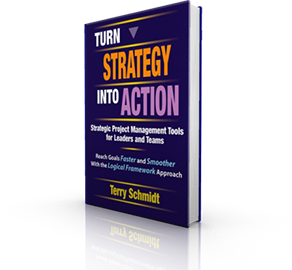 This four-page color article succinctly describes Strategic Project Management and the Logical Framework Approach. Ideal for sharing the concepts and tools with others. Comes in sets of ten. This double sided summary printed on heavy card stock provides a compact color-coded reminder of Logical Framework concepts and how to use them. Side One offers the step-by-step instructions for creating a LogFrame; Side Two defines each LogFrame element. Shipped in sets of 12. Make unlimited copies of the Reference Card for internal use. Reinforces major concepts and gets people focused on getting the results they need. These 18×24 inch thick color heavy stock paper Logical Framework grids let you draft your plan using classic input technology—pencil or pen! Worksheets come in sets of 10. These large wall-mountable laminated LogFrame grids allows several people to gather around and actively collaborate as a team. They are 54×36 inch and color-coded to match the four strategic questions. These re-usable grids are easy to write on and wipe off using dry erase markers. Includes both WORD and EXCEL spreadsheet versions. Print in landscape 8½ x 11 for your project design. Carry the LogFrame power with you wherever you go. These business card-sized fold-out reminders printed on heavy stock place the key concepts at your fingertips. Use your own reference or to give to others sets of 10. Don’t leave home (or work) without it! Download this reference library of real project designs to reinforce your understanding of Logical Framework concepts and get a head-start on your own project design. Each volume includes LogFrames with both work and personal examples. New volumes added often. Volume 1: General Examples Project in this 45 page volume provide a variety high quality examples including workshop design, self-development, non-profit fundraising, organization turnaround, re-engineering, IT system improvement, combating the Asian Gypsy invasion. Use this set of 70 Key Power Points to share core concepts with your peers and customers. Taken from our live workshop, they explain major principles along with examples. For internal trainers, this kit prepares you to train others. Includes agendas, workshop designs, handouts, workbook notes, case studies, solutions, training tips, and a expanded Power Point set. This unique personal mastery program will to equip you with most important strategic planning concepts to improve your effectiveness and prepare you for the Association for Strategic Planning (ASP) professional certification exam as a Strategic Planning Professional. Become proficient in designing projects and programs with the Logical Framework. 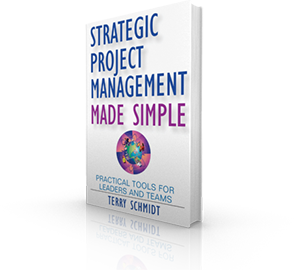 This program guides you every step of the way from initial problem/ opportunity through a quality project design. You’ll get private access to instructional videos, downloadable examples, design tips, and other tools to put these powerful ideas into practice now. This limited availability service is for managers who want expert critique and improvement of any project design. 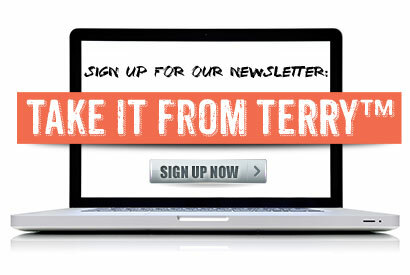 Terry personally provides up-front design support, critique of your drafts, and polishing via email and telephone. Since every project is unique, fee quotes provided after we discuss your needs. Fees depend on complexity and status. Contact Terry or call 206-433-0700 for a confidential discussion of your issues and objectives.